When Doctor Who restarted in 2005 Murray Gold was Russell T. Davies' composer of choice, and Gold is still composing the music for the series 10 years on. It didn't take long for the series to re-establish itself as a British institution, and Murray Gold's music quickly became recognised as a vital part of the show. The show's music has not only appeared with increasing frequency on CD albums, but it has also become a live experience for capacity audiences in major venues. 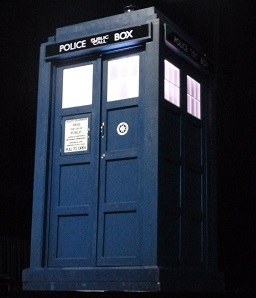 The seeds of these live shows started back in 2006 as part of the BBC's annual Children In Need appeal in 2006, which was held near Doctor Who's home at the Wales Millennium Centre in Cardiff. 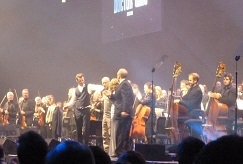 Then there were Doctor Who Prom Concerts in 2008, 2010, and its 50th anniversary year in 2013. 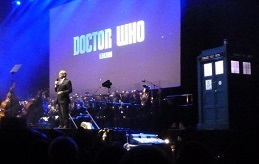 The show even went "Down Under" as the Doctor Who Symphonic Spectacular first in 2012 before returning in 2015, before the event returned to the UK for a tour of British venues later in the year. The sad fact is that the 2015 UK Tour has now finished, but not before Music Files was able to visit the last show of the tour in Glasgow on 29th May. But we're sure that the show will return sometime, somewhere in the not too distant future. 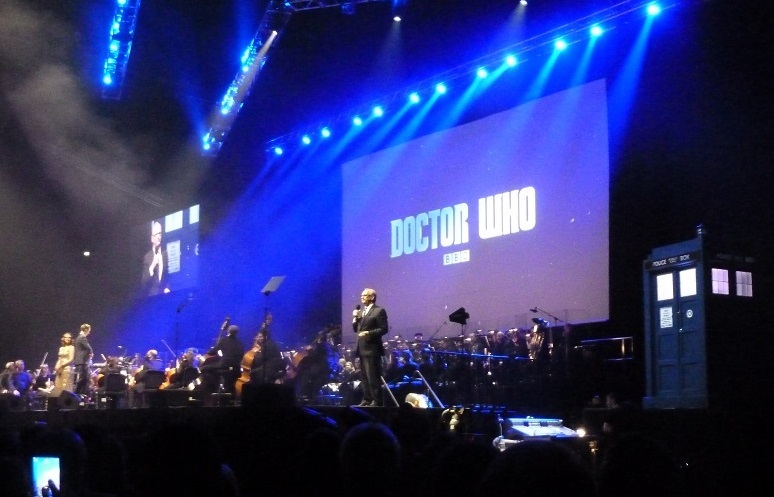 This UK tour was presented by 5th Doctor Peter Davison, and of course featured Ben Foster conducting the BBC National Orchestra and Chorus of Wales. 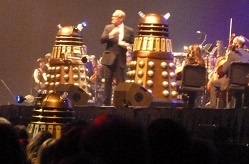 Foster has been with the show almost as long as Murray Gold, orchestrating and conducting the orchestra for the series' episodes and of course on the soundtrack CDs. 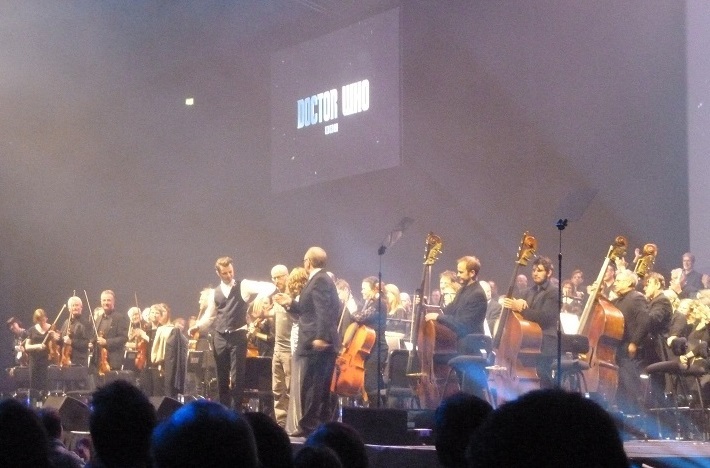 There was some banter between presenter and conductor throughout the show, keeping the tone lighthearted and family friendly but also playing to the fans with frequent comments suggesting a rivalry between Peter Davison and 6th Doctor Colin Baker. We're sure this rivalry is purely fictional, but it adds a nice element of fun to the show, as did references to Davison's 50th anniversary video special "The Five(ish) Doctors Reboot" and the family relationship with Davison's son-in-law David Tennant. 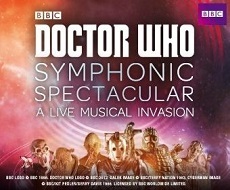 The main difference between the Doctor Who Symphonic Spectacular and some earlier concerts such as the Doctor Who Prom Concerts is the absence of Classical Music in the programme. The new show no longer feels the need to retain an educational element, or perhaps after 10 years of the new show there is now an ample back catalogue of recognisable Who themes to easily fill a dedicated concert and satisfy fan demand. 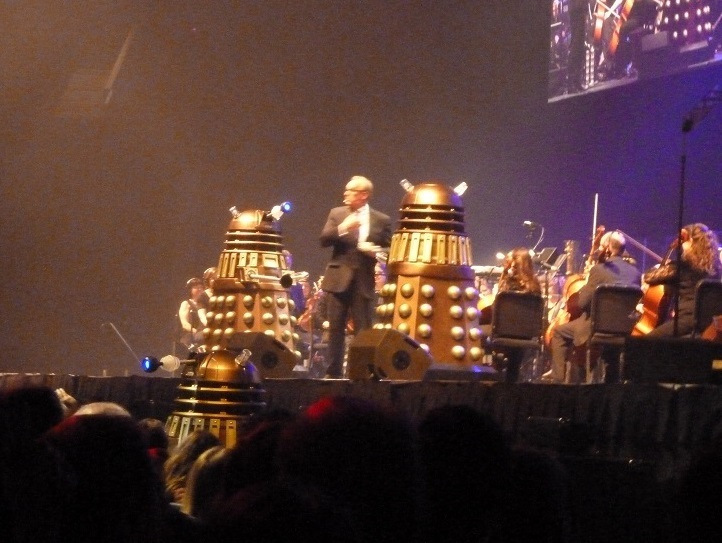 Newspaper reviews of the concert seemed to emphasise Peter Capaldi's first season (Series 8) suggesting this was the main focus of the show, but this was not entirely the case with many old favourites from earlier series also included. It should be noted that unlike most classical concerts, the orchestra for the Spectacular are amplified. There are both good and bad aspects to this. It allows all the elements to be better mixed and maintain a venue filling volume, but there was some borderline distortion at times. But no-one can argue with the boldly powerful statement of the amplified horns in "A Good Man?" otherwise known as "Twelve's Theme" or the sheer emotional impact of the choir singing the Oods' "Song of Freedom" as heard at the climax of "Journey's End". Of course a show like this aiming for a family audience could never be just an audio experience. 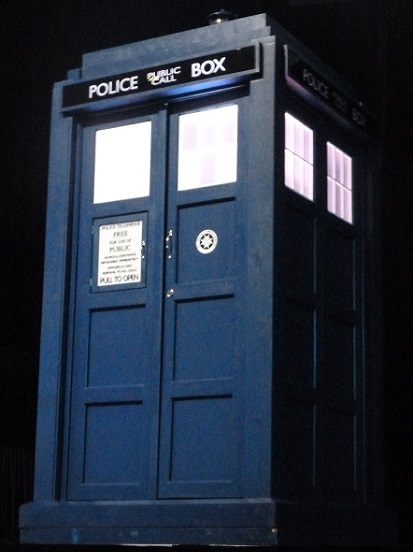 Doctor Who Music has a strong connection to characters and events in the TV series, hence the visuals are equally important in makng that connection. So while the music plays Suites or extended tracks from the Doctor Who soundtracks, the large screens carry a montage of clips from the TV show. These are not synchronised as in the original episodes but enough to provide that connection with highlights from the past 10 years (and occasionally earlier times) of the series. And then there are the monsters! Daleks, Cybermen, Silurians and Dream Crabs all made an appearence as did Vampires (from Venice), Ood, Ice Warriors, Whispermen, Silents, the Teller from "Time Heist" and the Mummy from the Orient Express in "66 Seconds". A highlight of the show for me was Elin Manahan Thomas singing "Abigail's Song" originally sung by Katherine Jenkins in "A Christmas Carol". But it was also great to see Murray Gold take his place alongside Elin Manahan Thomas, Ben Foster and Peter Davison to take the final bow to a standing ovation.